Wondering which Amsterdam airport transfers are most efficient? 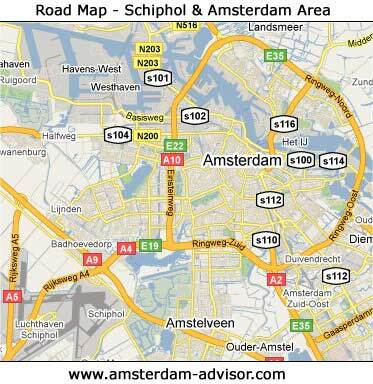 How to get quickest and cheapest from Schiphol Airport to the Amsterdam city center? Find out here about: trains, taxis, shuttles and cars. 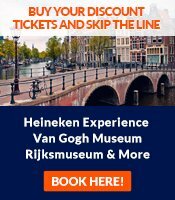 Click here if you have a stopover at Amsterdam airport and you're wondering if you have enough time to go into the city. This is our preferred option: quick and cheap! The airport's train station is right below the main hall (Schiphol Plaza). Trains leave each 10 minutes and it takes 15-25 minutes to Amsterdam Central Station (which is at the heart of the city center where most tourist hotels are). Some trains also stop at Amsterdam Lelylaan and Amsterdam Sloterdijk. To buy tickets, look for the big yellow machines that accept major credit cards and coins (no bills!). A ticket from the machine to Amsterdam Central Station is 3.80 euros; from the ticket desk there's an extra 0.50 euro charge. Don't buy tickets inside the train, you'll pay 35 euros extra! Once at Amsterdam Central Station, get a tram or bus (in front of the East and West Hall entrances), or hail a taxi (they stop outside the West Hall entrance). Most hotels aren't far from the Central Station. Don't know which bus or tram to take? Ask the bus or tram driver, go the big white tourist help center in front of the station, or call your hotel. They will be happy to help with Amsterdam airport transfers. 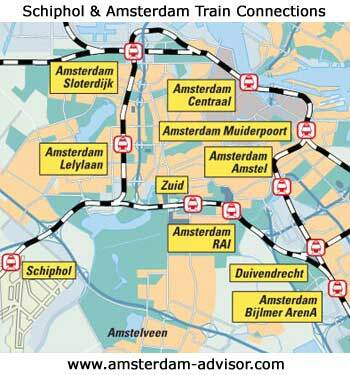 In case your hotel isn't reached easily from Amsterdam Central Station, you'd better take a shuttle bus or taxi. They stop right outside the Arrivals hall. A taxi to the Amsterdam city centre takes some 25 minutes (but much longer if there are traffic jams) and costs about 40-45 euro. All taxis are metered by law and the meters don't charge money when the taxi is standing still (e.g. in traffic jams, which there are a lot around Amsterdam!). When departing, one advantage of taking a taxi over the train, when is the taxi can take you straight to the gate of your particular airline. Note that if you ask your hotel to call a taxi for you, the taxi is not allowed to charge a higher price for this "hotel service" on top of the metered price. Connexxion has a shuttle service at their designated stop just outside the Arrivals hall. They run each 30 minutes between 6am to 9pm and go to almost all of the hotels in Amsterdam. Shuttles are the second cheapest Amsterdam airport transfers: the cost is 12 one-way, 19 return, and the trip lasts about 30 minutes. There's car rental at the airport (main hall), which includes all the major car rental companies. From the airport, take the A4 motorway in the direction of Amsterdam, then go on the A10 motorway that circles around the city center and take the appropriate turnoff (S101 to S118). But, if you are staying in the Amsterdam city center, a car is rather inconvenient due to expensive parking and traffic jams. You'll get around the quickest with public transportation (trams, subway and buses) or with a rental bike. Admittedly, outside the city center and the large canal belts, a car is more convenient for Amsterdam airport transfers. You can also have people in Amsterdam pick you up at the airport, there's "short parking" close to the Arrivals hall and the main hall (Schiphol Plaza). Do you have a stop-over at Amsterdam Schiphol airport and you're wondering if you have enough time to go into the city? As you can read above, including the waiting time for the train at the airport, Amsterdam airport transfers to the city center just take 30-40 minutes. The train is the safest option as they leave each 10 minutes and are seldom delayed - taxis and shuttle buses can get caught in a traffic jam, and this could mean e.g. 30 minutes delay. The Amsterdam canals are at 5 minutes walking from Amsterdam Central Station and the Red Light District is at only 10 minutes. At Schiphol, you can usually also check-in through the internet (if you only have hand luggage) - 24 hours or, with a paid service, even 7 days in advance.